BATON ROUGE — With every storm, there is a silver lining — the friends we make, the people we help, the people who help us, and maybe even something unexpected, such as the return of the hummingbirds! In late August 2005, my Fred and I were in Asheville, NC, to attend a family wedding. We watched TV accounts of the devastation in New Orleans caused by Katrina’s visit to our beloved Louisiana. Flights home were not available, and we wanted to return home ASAP. Our only option to return to Baton Rouge was to rent a car and drive. And drive we did, for over 24 hours! A play by play of our return trip home would take too many words. However, I recall when we arrived in Vicksburg, we rested in the lobby of a Holiday Inn whose kind inn-keeper welcomed weary travelers. We waited in line for hours and once the fuel deliveries arrived, filled our tank for the last leg of our trip. Well, here we are once again. We have just faced the devastation of Isaac. Brave first responders from all over the United States joined our Louisiana FR team. Citizens are challenged, some like never before! As I watched the events unfold, my heart went out to those rescued from attics and roofs of flooded homes, many clutching their pets with such affection. I paused and reflected about working with Harmony: Louisiana Spirit for two years after Katrina and the stories shared by evacuees from all over our state. I was reminded of the resilience of our citizens and their ability to bounce back with such conviction, courage, and an abundance of faith, hope and love. During Isaac, friends from NOLA were my house guests along with another friend from BR who lives alone, lost electricity and joined us. In spite of the wind gusts and torrential rains, we managed to enjoy our three days of togetherness, cooking, discussing, and solving all the problems in the world gathered around Grandma Grace’s dining room table that sits in my Caribbean kitchen! When my now “dearer friends” Steve and Althea Sabludowsky of Bayou Buzz, headed back to NOLA, he created this Thank You that I wanted to share with each of you. It touched my heartstrings and, prayerfully, it will touch yours. 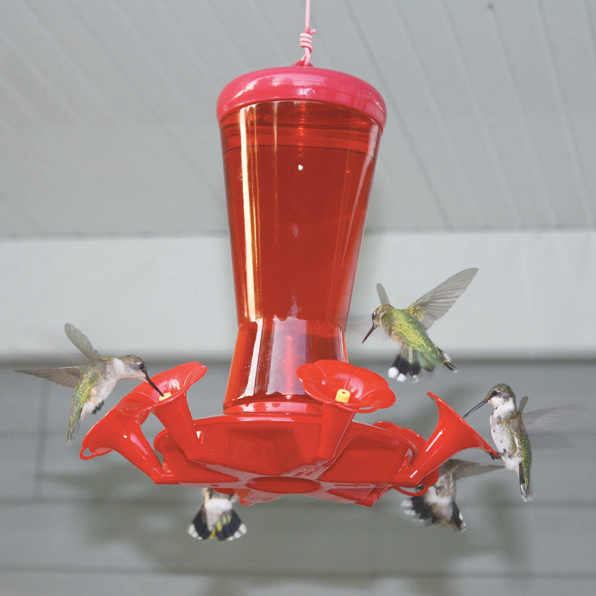 For Ronald Trahan of 16352 Frenchtown Road, the aftermath of Isaac has been a wonderful time that has seen the return of his beloved hummingbirds who have sought sanctuary — by the hundreds — at his home! He and wife Patricia have been feeding these miracles of God’s hand for 18 years. They use 3:1 water to sugar. Every year the birds return to brighten their days, but never like this year!